Go into any supermarket, and most butchers, and there’ll be shelves full of neatly butchered meat, prize cuts of rump, sirloin, tenderloin…the premium parts of the animal. What’s missing is the rest of the beast, all the other parts that don’t make up the standardised, easy to handle, easy to cook cuts that people so predictably buy. There might be a few bits of liver or a couple of kidneys, but that still doesn’t account for the whole animal. The simple answer is that it isn’t there because there’s no demand for it, and as industrialised farming has become so good at producing prime cuts at ever cheaper prices, there’s no wonder that demand for offal and other offcuts has plummeted. Why have trotters when you can have chops, we’re told, and our eating and buying habits have changed accordingly. McLagan’s premise is that eating the odd bits isn’t that odd at all, and she goes to some length in a captivating introductory essay to prove so, noting that prehistoric hunters would always eat their quarry’s heart and brain first, followed by the most perishable parts next. The ancient Greeks delighted in eating splancha, the animal viscera. There was less of it, so it was more precious than the animal’s meat, and merited respect and special handling. In Greece, kokoresti, skewered lamb offal wrapped with intestines, remains a popular dish. In France, these odd bits are still called les parties nobles, the “noble pieces” or “prized parts”. McLagan goes on to talk about the loss of food literacy, about the rise of convenience and the industrialisation of the food chain necessary to provide it. 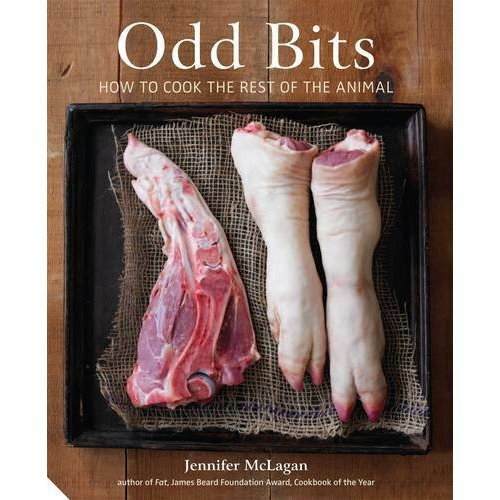 She acknowledges that the position of ‘odd bits’ in the modern kitchen is bleak, but suggests that things might change. While I doubt odd bits will replace the hamburger, I’d be happy if they just became mainstream. Imagine spicy tripe in tomato sauce for sale alongside those beef and vegetable kebabs at the butcher’s. Braised heart and cheeks a staple on winter menus. Liver stir-fry or devilled kidneys promoted as weeknight dinner fare in a food magazine. McLagan senses that a tide is turning and that these imaginings are starting to come to pass, and she may be right, with interest in offal and unusual cuts wrapped up in concern for animal welfare and a simple economic need to get more for our money. is a great place for any budding offal adventurer to start. McLagan’s is an enthusiastic and contagious voice, and her book covers all those strange cuts and weird innards in a logical and matter-of-fact way. McLagan starts with the hardest part first, the head, before moving from front to back through the “comfortably reassuring” cuts of the neck and shoulder, to the slightly more challenging feet before tackling the mysteries of the middle – the heart, the liver, kidneys and tripe. Such seemingly normal cuts as pork belly are covered here, an everyday and common sight in Britain, but seemingly not so to McLagan’s primarily North American audience, thus demonstrating that the perception and consumption of odd bits is largely cultural. The last part of the book looks at the back end, the hind quarters, and covers shanks and hocks, tails, marrow and blood. Yes, it’s challenging, in the sense that it addresses preconceptions and prejudices, but there’s much to be learnt here, and McLagan is an excellent tutor. What a amazing post here. I just went on amazon and ordered a copy of the book. I cant wait to get it in the mail to see what bizarre recipes you have in there. I always to talk to the butcher when I’m at the store to see if they have stuff in back. It is always cheaper and you can try different recipes that way. Great way to explore different seasonings.